Back when I was a uni student, I'd occasionally treat myself to a prix fixe lunch - two courses and a glass of wine for a set price. It was a nice way to try a fancy restaurant without busting my budget. Fun fun! 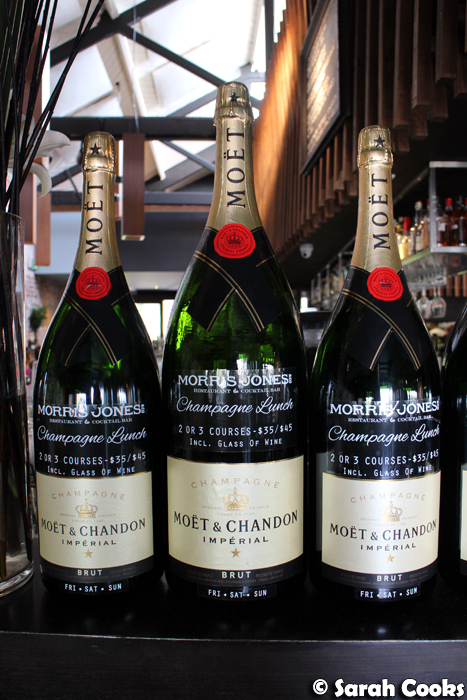 Morris Jones are currently doing a Champagne lunch on Fridays, Saturdays and Sundays. That's two or three courses of Champagne-inspired food with a glass of wine for $35 or $45, and I was thrilled to receive an invitation to try it out. Morris Jones is a restaurant and bar on the Windsor end of Chapel street. They've got a bit of a clubby vibe at nights, but on the Saturday afternoon we were there, the bright and sunny front area made a pleasant spot for a long lunch. I just had to start the lunch with a glass of Moët & Chandon Champagne! We also received a few snacky bits and pieces before the meal itself. First up, some oysters with champagne granita. I normally prefer my oysters natural, but the refreshing champagne granita really complimented the fresh brininess of the oysters without overpowering them. 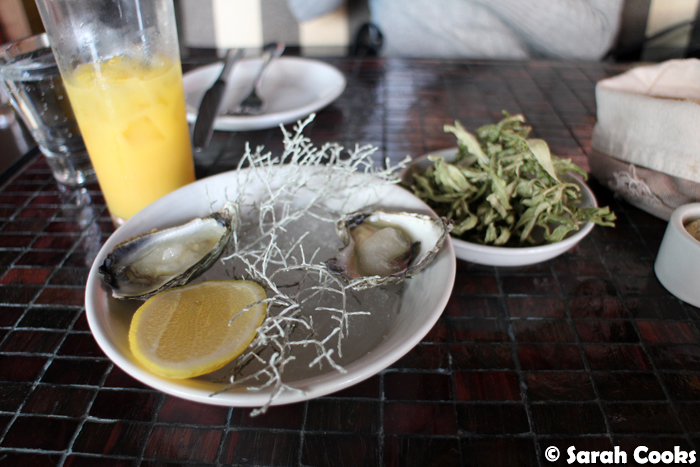 There was also a bowl of crisp salt and vinegar saltbush "chips". These were very salty and acidic, and at first I thought they were too strong... but they quickly became addictive and I couldn't stop eating them! 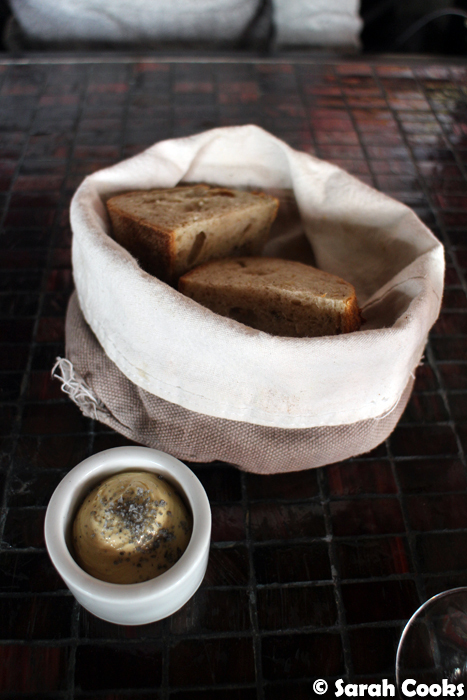 There was also some very good beer and caraway bread, made in-house and served warm in generous hunks. 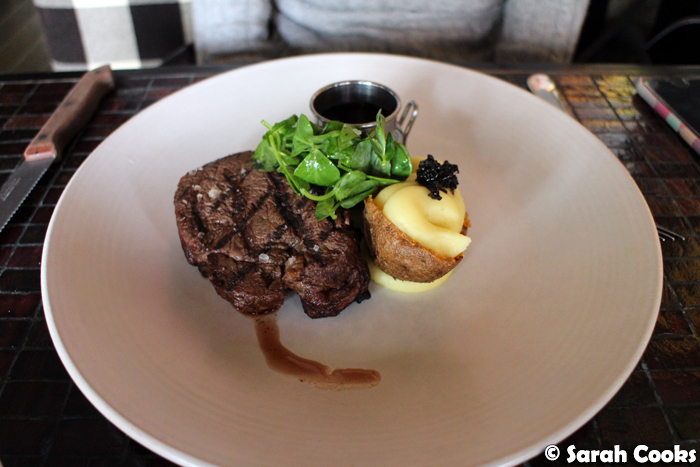 It also came with a pot of thyme and honey butter, that had a nice toasty flavour to it. Sandra and I decided to go for the full three courses each, and made sure we ordered different options so we could try lots of different things! The beetroot salad with goats curd, almonds and passionfruit, was a pretty, restauranty take on a classic salad. 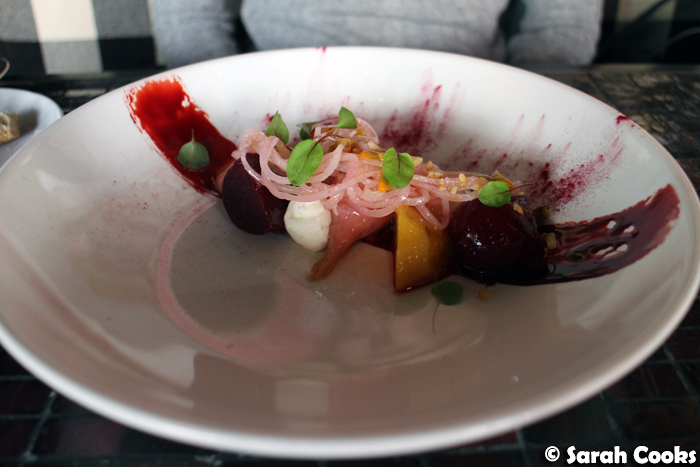 I enjoyed the variety of different coloured beetroots and the contrasting crunch of the almonds. 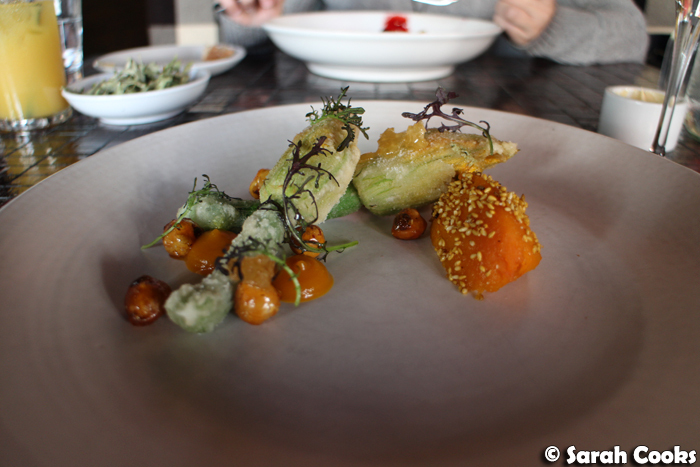 The zucchini flower entree was also very good. The zucchini flowers were stuffed with goats cheese and fried in a light and crisp batter. Sweet pumpkin jam and crisp caramelized macadamias were a nice accompaniment. Sandra ordered the fillet steak for her main, and it was very impressive. It was cooked well-done, just as requested, and whilst it was cooked through it was still tender and juicy. It came with a nice mound of refreshing watercress, and a very rich red wine jus. My favourite part of this dish, though, was the baked potato skin. 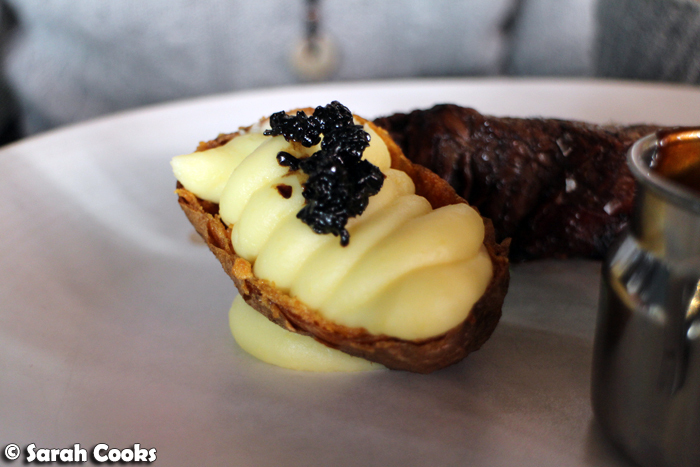 The potato skin was super crisp and filled with a gorgeously smooth potato puree. Delicious! 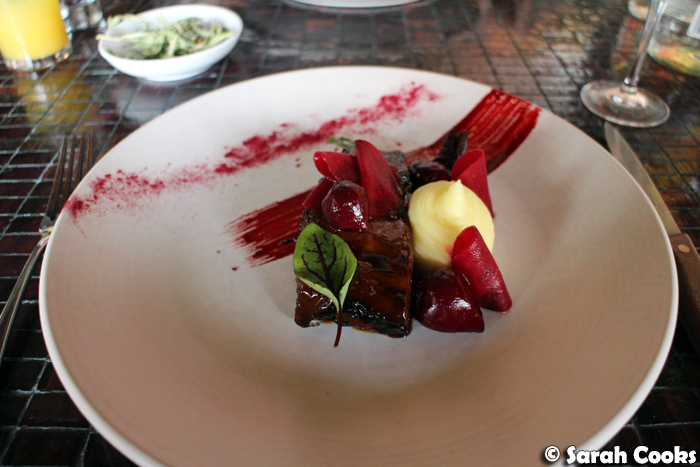 I also chose beef for my main - a caramel-glazed beef short rib, with variations of beetroot and some potato puree. The short rib was incredibly tender, falling apart at the prod of a fork. (A giant steak knife was provided, but happily, it was not needed). It was covered in a sticky sweet glaze, which was offset by the sharp beetroot and the creamy buttery potato puree. So good! And then it was time for dessert! On offer for the Champagne lunch are a chocolate dessert and a cheese course, and we tried one of each. 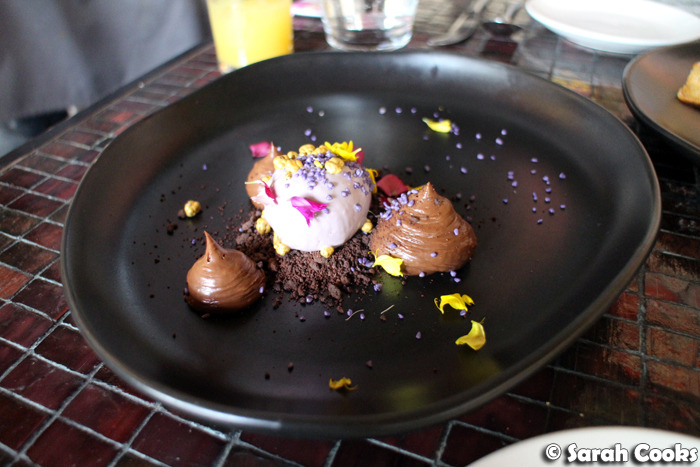 The nitro violet crumble dessert came with chocolate cookie crumbs, crystallised violets, violet ice-cream and some blobs of rich chocolate mousse. 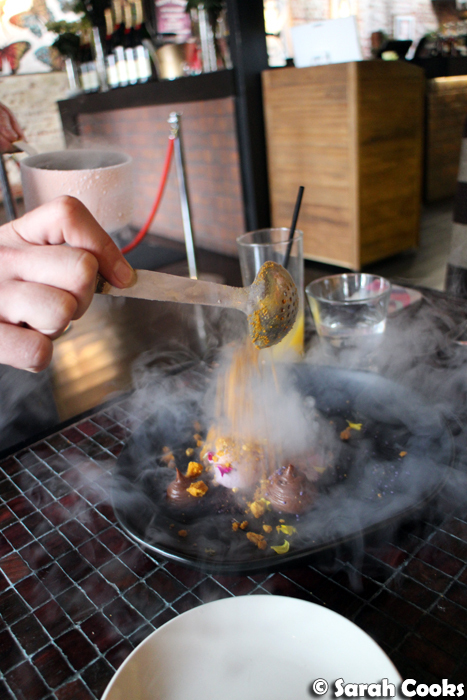 The "nitro" part of the dessert was freeze dried honeycomb, which was spooned over the plate as it was brought out. With the combo of chocolate, honeycomb and violet, it really tasted like a violet Violet Crumble! A simpler, but no less delicious, option was the cheese course. 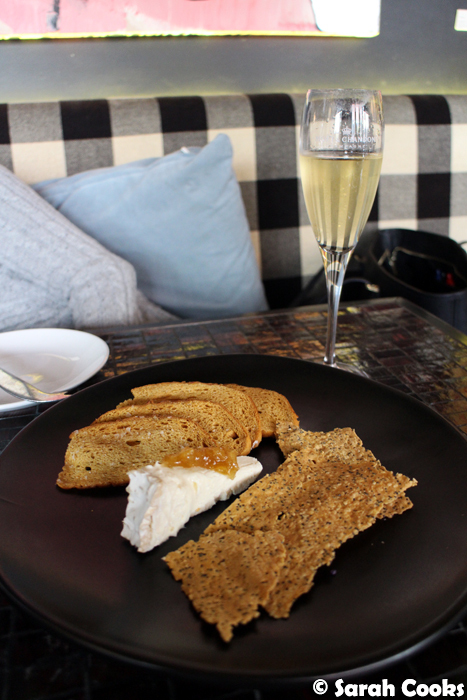 This was a truffled triple cream Le Delice, with a little honey and some very, well, crisp crispbreads on the side. I love the combo of rich cheese with Champagne and this was delightful. 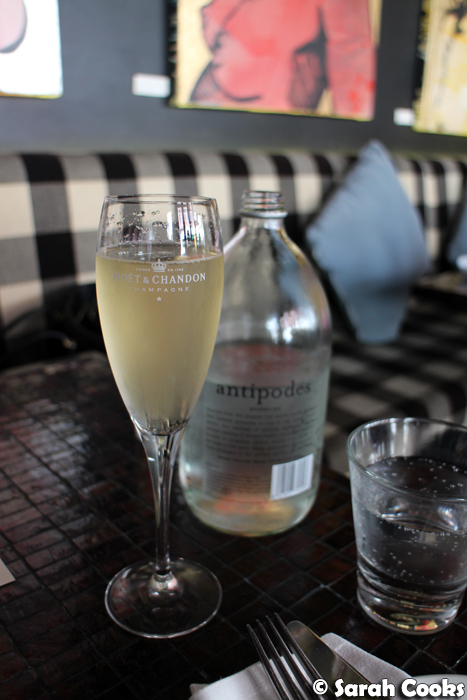 We really enjoyed the Champagne lunch, and thought it was a lovely way to spend a lazy afternoon. After the lunch we indulged in a bit of shopping down on Chapel Street - how fabulous! Not weird at all! I'd seen that potato skin on Instagram before I went to the lunch and I already knew I had to have it! That all looks so delicious, that cheese mmm and the potato!